First lifts open and there's the first proper snow for powder touring in Abries in the Queyras with the Rando Chiens to judge the depth. This is 11am on the piste above the Bivouac Restaurant today. Empty. 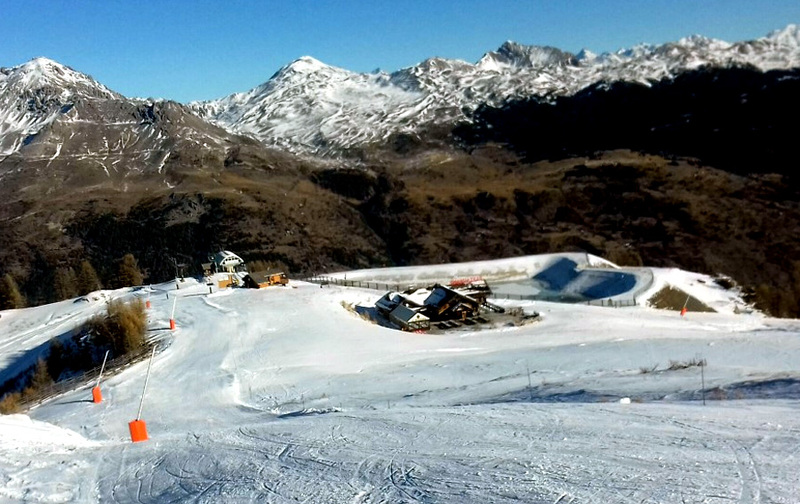 The pistes are in incredible condition thanks to the cold temperatures and snow cannons, freshly pisted, hard and fast, with no one yet here for the Crhistmas holidays. Yep with the sun shining it's the calm before the storm, both before the official opening with theholiday hordes next weekend and, literally, before the snow storms due to hit the Alps over the next few days! 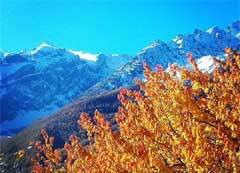 COMPARANOIA - IS THERE MORE SNOW THERE THAN HERE? If gazing at Christmas card pictures of snowy resorts in the Northern Alps is giving you comparanoIa (worrying if other ski resorts have more snow than you - or your holiday ski destination) then these images of our road trip, yesterday, to Abries mght just tip you over the edge and heading straight for the Queyras. Yep the small commune of Abries has benefited once again from Retour d'Est, the low pressure sitting over Genoa that constantly returns with snow from the east. The resort isn't opening until the week before Christmas which is even better news for powder hounds. 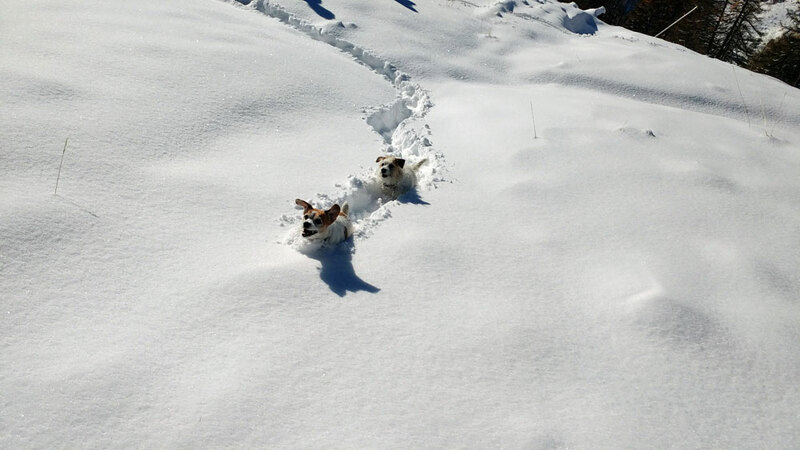 Our powder hounds, the Rando Chiens, were super excited to be out on the snow. 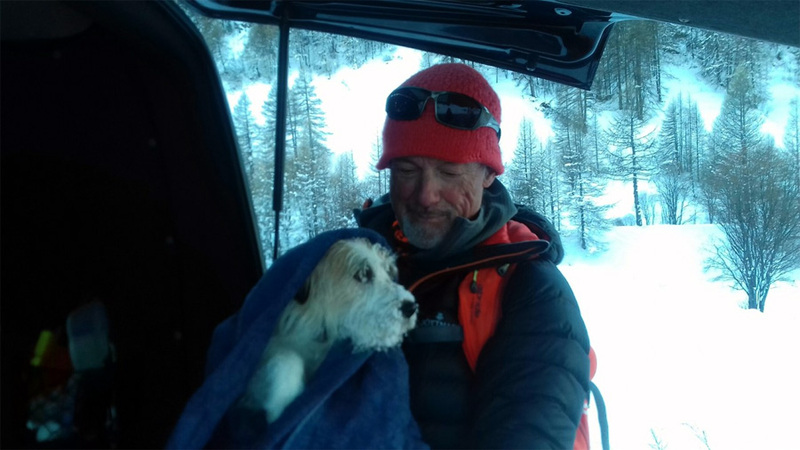 And you know the powder's deep enough for skiing when it's Jack Russell height (see pic). The sun was shining, the cold powder glistening as Gav, Ken and I arrived and parked up by the road. The piste basher had just groomed the piste down from the chair so we aimed for Manchester (the corduroy) at around 12 noon. Although the outside temperature in the mountain shadows as we drove there were saying -9C, it soon warmed up in the sun and climbing up the relatively steep gradient of the piste. Half a dozen other tourers passed us skiing down the piste. Yes the piste. Don't ask me why they hiked all the way up to do the piste! We went passed the top of the chair and up another 100m or so for around 600m of vertical. Then back down through the trees and under the chairlift in untracked (see Ken below) with some combat skiing avoiding gorges, tree stumps, branches and sudden dips not yet covered by snow, then survival style down a very narrow steep little path. The snow was perfect cold pow at the top, transforming to grippier stuff half way that stuck to the bottoms of the skis and, finally, crust at the bottom. The Rando Chiens managed to stay in our tracks but Beanie, who is hairier needed a rub down with a towel back at the van. It was a good test for the kit early in the season and before going to Japan in January. Both Gav and I are very happy with our latest all mountain ski set ups - I have the new Nordica Santa Ana's (110 wide) and Gav has the Black Crow Atris (108 wide), both with the new Diamir Tecton bindings, which are absolute game changers with easy tech cliips in and the alpine- like heel bindings. Only trouble is that I was using Gav's skins from his Scott Cascades, also 110s, as he now only has one ski, losing the other in an avalanche last winter. They seemed to fit perfectly, modifying the clips onto the tails rather than the holes as on the Cascades. Sadly, though, they slipped off the tails whenever the going got steep and I had to traverse, leaving me sliding backwards. So off today to buy new ones! Back using those amazing mountains inventions, ski lifts! 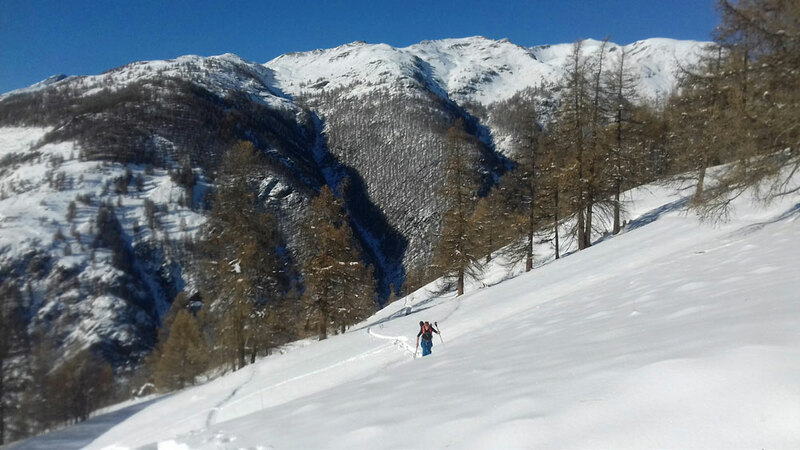 It's been a while since the lifts in resort were last open - and, meanwhile, in the late spring and early winter any skiing has meant hiking up on skis and skins. 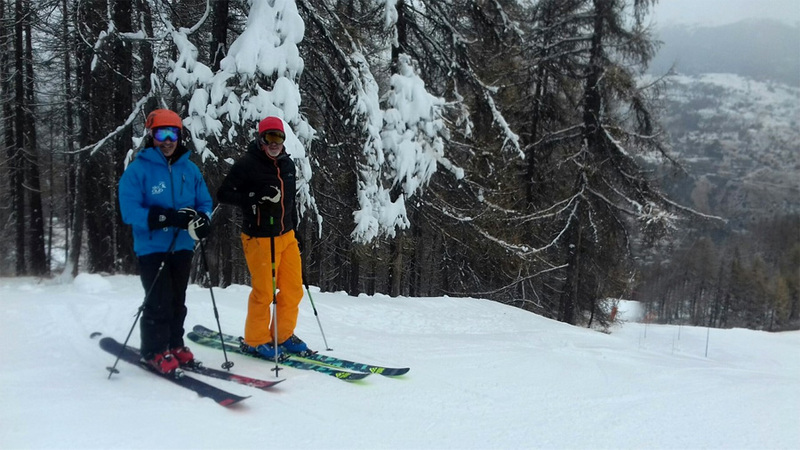 Today,Saturday, part of Serre Chevalier opened earlier than scheduled just for this weekend so, even though the weather was pretty grim and grey, minus 5C at 8am, it seemed rude not to don thermals and inner gloves to go up and ski what's open. It was worth it to ski the empty pistes and sidecountry cms of powder for a few laps joining the locals and keen Brits who live here for a social couple of hours. 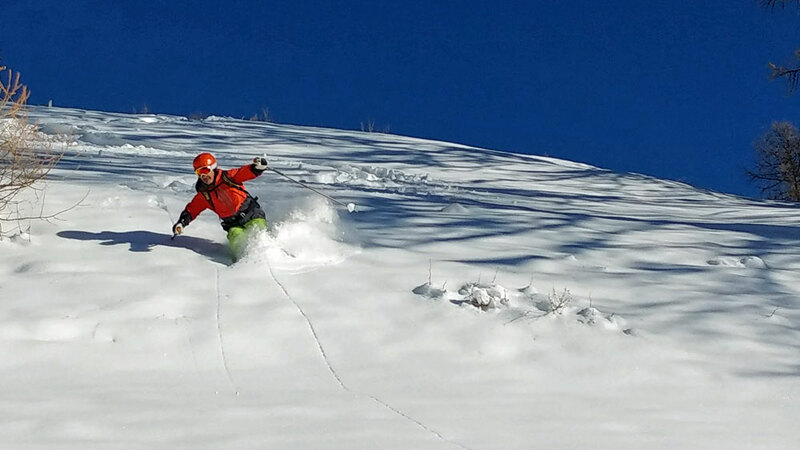 If we wanted to fuel the 'comparanoia' created by worrying that other ski resorts have more snow, we'd exclaim the 'snow was epic' and the 'pow was awesome'. Just look at the snow laden trees behind Ken and Gav in the image above!